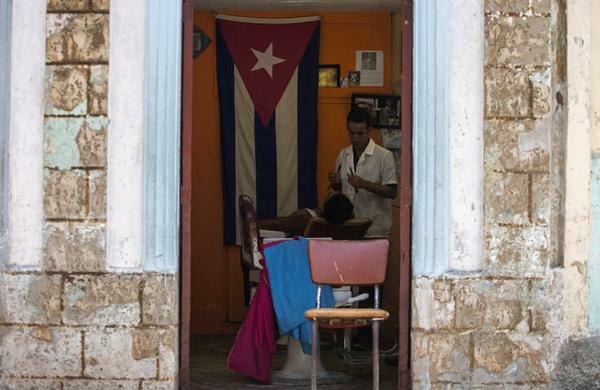 A Cuban barber shaves a customer at his privately owned business in Havana. We haven’t heard much from Miguel Díaz-Canel since he became the new President of Cuba three months ago. But new regulations for private Cuban businesses came out Tuesday - and they may confirm fears that Díaz-Canel doesn’t wield much power. Last year, Cuba’s more hardline communist leaders put the brakes on the island’s growing private sector by freezing new business licenses. Since Miguel Díaz-Canel replaced Raúl Castro as President in April - and since he is said to support broadening Cuba's private sector - Cuba's entrepreneurs hoped he would loosen things up again. But new regulations announced in the official newspaper Granma didn’t raise their hopes. In fact, starting later this year, Cubans will be allowed only one business license per person. That’s because communist bosses fear too many Cubans are starting to make too much money. There is some good news for Cuban capitalists, who are known as cuentapropistas. New private businesses like restaurants and bed-and-breakfasts can start opening again. Still, the regime also warned it will exert more control over them – and collect more taxes. The question is how the regime can squeeze cuentapropistas and still keep Cubans' heads above water as their economy keeps getting weaker.